Dragon fruit is a sweet fruit native to Central and South America. It's bright red or golden skin with pointy green leaves makes it easily distinguishable from any other type of fruit. 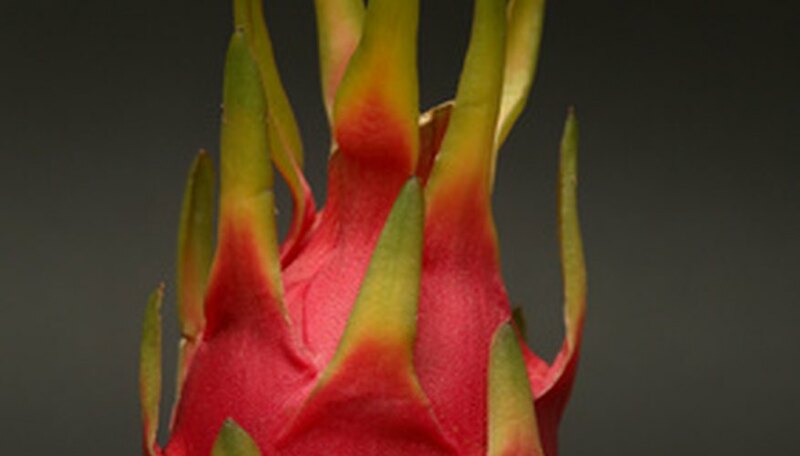 Dragon fruit grows on the pitaya cactus, which is yet another characteristic that makes this fruit stand out, as most other fruits grow on trees or vines. Unless you live in the desert or subtropical region of the country, it can be nearly impossible to grow a pitaya cactus outdoors. However, they can be grown indoors no matter where you live. Fill a large terra-cotta pot with a high-quality, well-drained potting soil. A pitaya plant can grow up to several feet tall, so the pot should be as large as possible, no less than 1 foot deep and 2 feet wide. Rinse the dragon fruit seeds under running water if they came directly out of a fresh dragon fruit. If any flesh from the fruit is on the seeds, it may cause them to rot. Put five seeds in the center of the pot and cover them very lightly with soil. It's best to plant extra seeds, as some may not germinate. Water the soil so it is thoroughly moist to the touch, and cover the top of the pot with a layer of plastic wrap. The plastic wrap will help the soil retain humidity, which in turn promotes seed germination. Place the pot in a sunny window; ideally, the window should face south. Monitor the seeds daily and remove the plastic wrap as soon as a seed sprouts, usually between 10 and 14 days. Keep the soil damp and make sure the seedling gets as much sunlight as possible for optimal growth. If you have multiple seedlings, thin it down to only the healthiest looking plant once they reach a height of 3 inches. Put a long wooden stake in the pot so it stands straight up alongside the plant. The pitaya cactus cannot support itself, so the stake is necessary for growing a healthy plant. The stake should be at least 4 feet high. Tie the plant to the stake with a string once it reaches a height of 6 inches. The string should be loose enough that the plant has room to grow, but tight enough that it gets support. Tie it every additional 6 to 8 inches afterward. Wait for the plant to grow flowers, which can be anywhere from 6 to 12 months. Watch for them to bloom, as you need to pollinate the flowers to produce fruit. The flowers bloom at night, so you may need to stay up late to see it occur. Rub the entire inside of a flower with a cotton swab to gather pollen. Rub the pollen on the inside of every other flower on the plant to promote pollination. If successful, the flowers will grow dragon fruit.